Carrier Air Wing Three deployed aboard the USS Dwight D. Eisenhower is made up of about 70 aircraft, which require many hours of maintenance per flight hour flown. When the fixes or scheduled inspection are not superficial, the aircraft is brought down to the carrier’s hangar deck. Even though this is a cavernous space, filling it with dinosaur sized aircraft gets tight real quick. Packed hangar bays were even more common during the Cold War, when up to 90 aircraft were carried on Nimitz Class carriers during deployments. Making things even more challenging was the fact that many more types of aircraft made up a typical super-carrier air wing than what the Navy fields today. The smaller Midway Class carriers had it even worse. Even with less aircraft than in the past to service, as deployments draw on, space can be at a premium in the hangar bay. Check out this pic of the USS Ronald Reagan during a deployment. 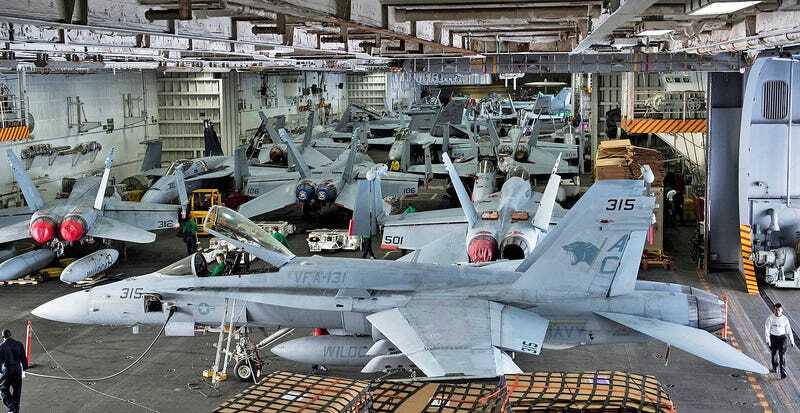 The U.S. has a luxuriously large hangar bay on its carriers compared to the Russians, Chinese and Indians. Check out this picture of Russia’s Admiral Kuznetzov’s hangar bay packed with massive Su-33 fighters. The USS Dwight D. Eisenhower is currently undertaking advanced training with its air wing and escorts in the Atlantic. Early next year the entire strike group will participate in Composite Unit Training Exercise (COMPUTEX) before being certified for deployment.